Unification Thought, as systematized by the late Dr. Sang Hun Lee, is currently the only major “philosophical” exposition of the Divine Principle in the Unification Movement. While some appreciate Unification Thought, others find its contents puzzling. I am both fascinated and perplexed by Unification Thought. In this article, I articulate some critical areas to be explored in transitioning from Unification Thought (UT) to Unification Philosophy. What is the heart of philosophical discourse? It is self-examination. Many may recall from high school or college the Socratic method or the emphasis on self-examination. Self-examination is intrinsic to the discipline of philosophy. Philosophy examines its points of departure, presuppositions, approaches, and processes of reasoning. It questions and tries to justify its own discourse: why, how, and where it can start, proceed, and finally conclude. UT lacks in the area of self-examination. It is a reiteration of various truth-claims from the Divine Principle (DP) with some additional truth-claims. It presupposes various assumptions from the DP without critically examining them. In philosophy, the reader does not necessarily share the same assumptions with the author. Yet, readers can learn from and gain irrefutable insight through the author’s rigorous process of reasoning. For this reason, non-believers can enjoy reading Augustine and gain invaluable insight and theists can learn from reading Nietzsche and Sartre, who were radical atheists. Readers learn more from honest and sharp critiques than mediocre apologetics. The lack of critical self-examination is the most glaring deficiency of Unification Thought, which therefore makes it unattractive to some readers. The lack of self-examination also denotes that there are three missing elements from UT: 1) An articulation of its philosophical methodology; 2) a comprehensive and well-developed account in each area of philosophy; and 3) an exploration of the philosophical contributions of the Divine Principle. Methodology articulates how philosophy precedes its discourse. 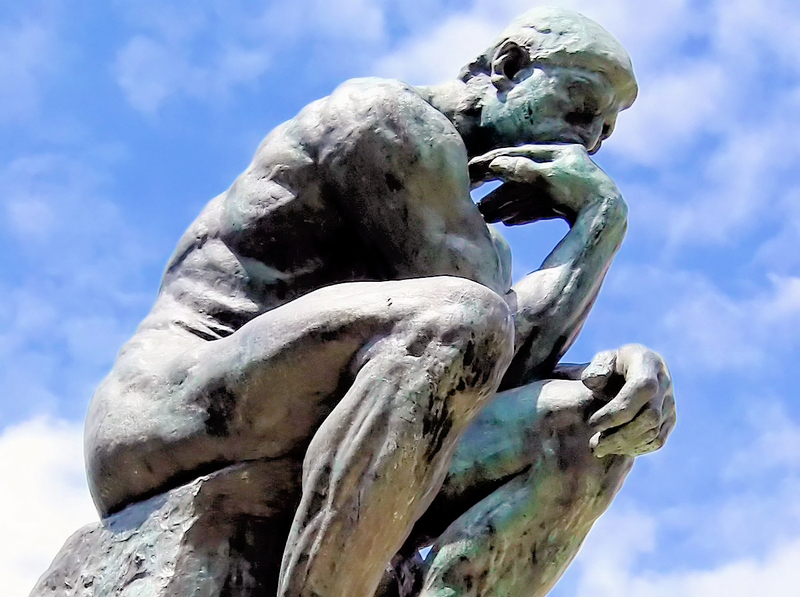 It is the way in which a thinker moves his or her argument; the articulation comes from how one identifies and defines philosophy and its tasks. Some examples are deconstruction, phenomenology and the logical analysis of language. What then is the philosophical methodology in Unificationism? It cannot be chosen arbitrarily. It is derived from the aim, task, and identity of the discourse. What is the intellectual aim, task, and identity of a philosophical work based on the Principle? The primary task of UT should be the integration of thoughts and ideas within a theistic framework. Therefore, the methodology must be that which makes integration possible. Needless to say, philosophers have made various attempts to develop a methodology that can apply to all possible fields of knowledge. As I noted, deconstruction or a logical analysis of language are some methods that philosophers have attempted to apply to all types of knowledge. Can we apply those methodologies in UT? One can certainly do so, because philosophers define philosophy as an activity rather than a body of knowledge. The question is what is the appropriate method with which to realize the integration of ideas within a theistic framework as envisioned by UT and the DP? Over the course of history, disciplines were defined according to the nature and type of knowledge, and philosophers identified methodologies to validate such knowledge. In scientific disciplines, the scientific community sets the standard procedures and methodologies with which to validate scientific knowledge. In religion, knowledge is often retained in the form of narratives, such as in the Bible or in the founder’s revelations and practices. In the DP, while truth-claims are made based on biblical narratives, their truth is defined as that which encompasses religion and science. In other words, the justification of truth-claims rests on biblical narratives, yet DP defines its truth as transcending the boundaries of religion. Neither in the UT nor the DP has this all-encompassing notion of truth been elaborated upon beyond this brief description. Then, what is the philosophical methodology that will validate a type of knowledge claiming to unify diverse and distinct bodies of knowledge, when each discipline has its distinct methodology? A selective and convenient mixture of various methods for the sake of an apologetic is far from adequate. This issue raises the question of the nature of methodology in science (natural, social and human) and religion. Is it possible to integrate such distinct forms of knowledge and their methods? The claim of the integration or unification of knowledge (conceptualized as the “unified truth” in DP) must have a much clearer exposition. It needs to answer at least three questions: 1) what integration or “unity” means; 2) why it is possible; and 3) how it is possible. In order to answer these questions, we need to examine and clarify the nature of religious knowledge and its justification. It requires us to spell out the Unificationist position regarding standard questions in metaphysics and the philosophy of religion. Since Unificationism makes such bold claims, it carries the high burden of articulating its position and presenting the method with which to realize the stated claim. I believe hermeneutics is the best method with which to integrate diverse disciplines and forms of knowledge and I will elaborate my position on another occasion. The approach used in UT is deductive reasoning. Although UT does not explicitly explain its method of reasoning, this is quite apparent. Each theory in UT is deductively constructed out of key ideas/concepts considered as “revelations” in the Principle (the question of “revelation” must be expanded upon, but is not discussed here). Deductive reasoning is good for preserving an internal coherence within a system. This approach, however, has the danger of making the theory too narrow and incomprehensive if it chooses limited assumptions; it runs the risk of leaving out key issues. By relying solely on deductive reasoning, each theory in UT leaves out key issues and cannot integrate dominant theories across various fields and disciplines. For example, consider UT ethics. UT developed ethics as Family Based Virtue Ethics, a theistic, Confucian-type of virtue ethics, which places an emphasis on character education. Virtue ethics certainly has its own merits, but it is hardly a comprehensive theory. It leaves out key perspectives used in the DP, which are elaborated on in competing theories such as Utilitarianism, Deontological Ethics and Social Contract theory. 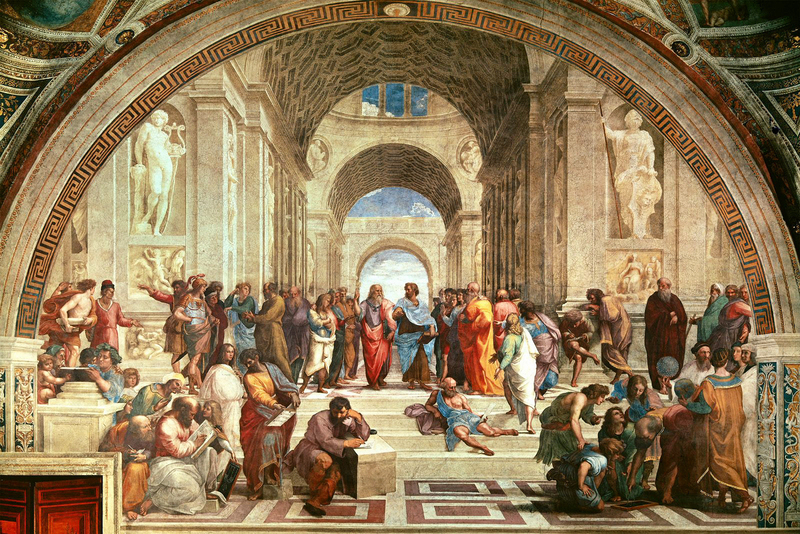 A detail from the fresco “The School of Athens” by Raphael, that depicts Plato, Aristotle, Socrates, and other philosophers. For example, in the DP, a consequentialist argument is used to justify the resurrection of evil spirits; a motive-based argument is used to determine relative good and evil between the spiritual and physical Fall; the contract theory speaks directly to the concept of a covenant between God and humankind. The DP uses such diverse forms of moral reasoning, which have been formulated as standard theories in ethics. Nevertheless, UT ethics leaves out key issues such as the origin of moral obligation and the principles of moral judgment, even when such arguments are used in the DP. UT ethics must integrate these various fields and disciplines in order to integrate the various forms of moral reasoning found in the DP. In order to rectify the problem, UT needs to be re-constructed by taking a synthetic or integral approach, which utilizes both deductive and inductive approaches. Today we face a new intellectual climate bringing with it new challenges. Until the 1970s and 1980s, people sought a grand-narrative, one-size-fits-all grand theory such as Marxism or Unificationism. UT combined with Victory Over Communism (VOC) theory was presented as a counterproposal to Marxism. After the failure of communism and leading into the present, people have turned away from grand-narratives and sought diverse and localized truths that address specific issues and areas. Dr. Keisuke Noda is Interim Dean and Professor of Philosophy at Barrytown College of UTS. He has been teaching courses in philosophy, ethics and Unification Thought at UTS since 1996, and taught Unification Thought as a senior lecturer at the Unification Thought Institute both in the U.S. and Japan since 1972. He earned his B.E. in applied physics from Waseda University, Tokyo, Japan; M.L.S. from the Graduate School of Library and Information Sciences at Queens College; and M.A. and Ph.D. in philosophy from the New School for Social Research. Photo at top: A casting of “The Thinker” by Auguste Rodin. Well said. I’ve always believed that Unificationist thinkers must think and act along the lines of the early church fathers, who systematically used their classical Greek training to exposit on the teachings of Jesus in all areas of human concern. They did not simply leave it to revelation or evangelism to make their case in the superiority and utility of Jesus’ teachings to the exigencies of the human condition. In so doing, they collapsed the grand narratives of the day until Christian Thought replaced them. This is the great task of Unificationists today: to advance the spiritual drive alongside rational understanding…because either, singly, only carry one so far. But I don’t believe people have turned away from grand theories. If it’s true people have turned since the 1980s to localized truths, I think it’s along the lines of picking and choosing from multiple grand theories to construct their own grand theory. The fact is, people want a grand theory and in the absense of finding a working one, build their own to suit out of whatever’s handy and makes sense…because the drive is to answer life’s questions on the grand scale. Grand theories of the past have failed. Christianity, the largest and most comprehensive grand theory, has been failing before our eyes for 70-100 years. Unificationism is a grand theory, and our task is to surpass Christianity’s contribution to answer life’s questions, using the philosophical tools created from Socrates’ time through today to fully engage and understand Father’s revelation and evangelism. Would not the term “Unification Philosophy” imply a grand narrative rather than Unification Thought, which does not necessarily have to assume that position? The use of terms such as synthesis and integration have already been applied in UT discussions, but perhaps not formalized in UT texts. In theological departments, these terms are discussed as well as hermeneutics. Also, in the field of biology, for example, new terms such as “Relational Biology” are being used to describe the relationship of organisms to the environment in an effort to formulate integrating and synthetic approaches with scientific evidence. As you state, I would think that empirical evidence as well as theory and revelation is important to any philosophy or thought with intended goals and/or vision. Theory and Praxis….Process Theology…Action/Reflection models…. And, I might add that self-examination is not a modus operandi of UC practices or church mission approaches. It sounds like we are calling for that in more ways than one. Dr. Noda raises some good points about the shortcomings of Unification Thought, but what his discussion fails to consider is that the basic principles he finds absent from the discipline — “self examination,” “moral obligation,” or any other kind of introspection, for that matter — are not the goals of the movement, which focus instead on absolute unity, other-directed behavior, and living for the common good, rather than self-betterment or individual morality per se. Perhaps Dr. Noda could expand his discussion to include how the basic tenets of UT will fit into the expected behaviors and thought patterns under the CIG Nation/State. Such a study might have more practical relevance in the long run and prove, once and for all, whether UT as it exists now is outmoded and in need of replacement. Dr. Noda is proposing a very much needed transition from Unification Thought to Unification Philosophy. Unification Thought is a form of ideology more at the level of intellectual rigor of Marxism, which contains many unproven suppositions like religions have. Philosophy must challenge these suppositions and clarify what can be considered “true” and what remains in the realm of supposition. But, as Dr. Sebastian Matczak used to teach us at UTS, philosophy is also about the pursuit of the good life, and what human beings need to do to achieve it. It should engage in discussions about how human beings can achieve happiness in the world. In this respect, I believe it is very important to develop a philosophy of social institutions, and not just philosophies for personal living. Today we no longer live in a world in which a tribal head or king is the absolute authority. We live in a world of social institutions: governments with many agencies, a financial sector with many components, and a cultural sphere with very little agreement on any principles at all. The cultural sphere ends up dominated by the political and economic spheres. In my view, many of the philosophical issues related to individuals have received a good start in Greek and Roman philosophy, but our understanding of social institutions is very weak and causing a lot of trouble all over the world. Our thinking about theory and/or philosophy needs to be connected with praxis or action. An application of Unificationism would include activities connected to thinking, such as give and receive action with others, since the methodology to carry out Unificationism is give and receive action. UT goes on to say that give and receive action is for the purpose of mutual existence, mutual prosperity and mutual righteousness. It would be good to have a seminar that would invite academics and leaders from different backgrounds to engage in dialogue about the questions Dr. Noda poses, such as how to create an integration of ideas, or as Dr. Anderson asked, how to apply UT to social institutions. And that’s because you are utilizing your God-given or natural (?) power of introspection, Sir. Know yourself, be yourself and love yourself. This article is interesting. I appreciate the author taking the time to make all of these observations. I agree, however, with what a previous commenter, Christopher McKeon, said. People have resorted to constructing their own grand theories that work for them. I also agree with Gordon Anderson on the need for incorporating our Unification theory into social institutions. I believe all this can only begin when we as practicing individuals go out into the world and show, not by word, but by action, how much different and better we are because of our practice. I am neither a theologian nor a philosopher, yet I enjoyed Dr. Noda’s article very much and think the subject he addresses, of translating Unification Thought into philosophical terms, is vital if Rev. Sun Myung Moon’s discoveries and ideas about the nature of God, and God’s Providence are going to be understood in the future by religious leaders and theologians, philosophers and the common person. Much of Rev. Moon’s thought contains such powerful ideas which can and should be discussed and debated on an equal footing with the best scientific and philosophical thought today, and can ultimately have a profound impact on the world, and even has the potential to bring religion and science into harmony. They can form the foundation for understanding in a deeper way than ever before the nature of God and the universe, and humankind’s place in this universe, without having to expect everybody to necessarily “believe” in these ideas as religious truths. In the early days of UTS, we experienced some very exciting times hosting theological conferences, which attracted many interested and respected theologians. It’s a shame, I think, we didn’t at that time also have philosophical conferences with notable philosophers. Hopefully, Dr. Noda will produce a philosophical interpretation of Unification Thought, and UTS once again can revive those exciting times and inspire a new age of theologians and philosophers. I enjoyed this post and think the article is timely and introduces quite a few thoughts and challenges. I work in aesthetics but touch upon a few elements of Unification Thought. Over the last year, I have posted four slide shows on Original Image, Original Nature, Ontology and the Theory of Art. In lecturing I have found this way of presentation to be very effective, particularly with the younger generation and university types. Obviously the language used is important and I suspect, is also more effective when contextualized with the modern mindset. The Theory of Original Nature can be found here and slides parallel the online text often using the same section headings. The others can be found at the same location. During my studies, I have come across certain anomalies of which I will only mention a few. In some cases the work has already become dated insofar as the old communist model of socialist realism might be better updated to more contemporary philosophy or to what is now called Cultural Marxism which pervades Western thinking. In the art section I also suspect Logos should be complemented by Eros as creative model rather than positing a limited framework of realism. This might be relevant in terms of what exists from Plato (Symposium) through the Renaissance and on into systems thinking and archetypal thought today. It may also relate well to the emancipation of the female, currently a very pertinent concern. In the psychological world, there are profound explanations for the dynamics of creativity including developments in neuroscience, which I personally don’t think can be ignored either. Naturally psychology is not philosophy nor is it UT, but when contextualized properly it can be very illuminating and supportive of putting ideas onto the ground. In general, I find the division of sections in UT problematic. Goethe points out that knowledge compartmentalized is an Enlightenment convenience is not a model of how the philosophy of mind actually functions (morphologies). In terms of systems thinking, there is obviously a need to embrace autopoietic (social) systems, integral holons and archetypal patterns as found in my studies which end up saying much the same as DP or UT suggest, if one can separate humanism from the more consciously transcendent models, yet retain valid empirical details in the same breath. This kind of work helps open UT to bridging to other groups without compromising core values; it is a way to start up a conversation. In my travels I have also come across submitted papers advocating the use of the term evolution in relation to Ontology — a great mistake to my way of thinking. If great care is taken in explaining what one means by this, it could work, but the general thrust of the Founder’s words, DP and UT do not confirm this idea easily. Evolution as they say is phenomenology not Ontology. Therein, perhaps, lies the challenge virtues and core values present to us. Allow me to approach just a few aspects of your interesting article: Maybe I got you wrong, it was without bad intention, I just love to discuss philosophy. In your critique on the lacking of self-examination in UT thought I would argue that in contrast to Socrates time there is another approach in self-examination in later ages than in Hellenic times. The major difference is that competing theories were rare but as time advanced many different ideas on similar subjects occurred. In my studies on practical philosophy in Munich, self-examination took place in comparing competing thoughts. In my view, UT is doing exactly this as well and by this becomes much more tangible, namely by analyzing competing thoughts who become sparring partners. The ontological base is, in fact, deductive in theory of the original image, but is this not similar to Christian philosophy, even though fewer contents are available? The epistemological way, however, is inductive, since reason and experience are seen as the basic unit or tool of human cognition (page 401, NEUT). One thing that I noticed right away is that you say that Utilitarianism is not being addressed in UT ethics. ( “It leaves out key perspectives used in the DP, which are elaborated on in competing theories such as Utilitarianism…”). But it is being discussed in one whole chapter from page 293 to 295 (NEUT). Bentham and Owen’s ideas are being analyzed here. Lastly, I could not answer the question of the difference between “philosophy” and “thought”. My guess is that there must be a reason why UT is not UP, but I could not figure it out. We have a blue book entitled “Unification Thought” and we can find, if we searched, in Rev. Moon’s teaching, the system which explains how God thinks. The book and the system are not equivalent. The books offers lots of material for thought, but neglects to point to the system. We Unificationists should rather seek the “theoretical system” (NEUT, p. xii) of which God Himself uses to think. Once we find it in Rev. Moon’s teaching, his words, we can begin to understand Logos, which was the system created in God’s mind, through which all beings in the Universe were created. Once we can understand, visualize and imagine that system, which, by the way, is the same on every level of creation (per Rev. Moon), then we can solve, once and for all, all the problems that we have. We would have to offer some sort of models or blueprints on every level.